MILLVILLE, N.J. – More than 50 years old, the current Vineland, N.J. Police Department building includes obsolete heat and air conditioning, lacks the necessary space to effectively manage growth, and has an inefficient basement area. A new facility, scheduled for completion in early 2019, should resolve these issues. “From the ground up this building is being created the right way,” says Vincent A. Myers, AIA and principal of DI Group Architecture. 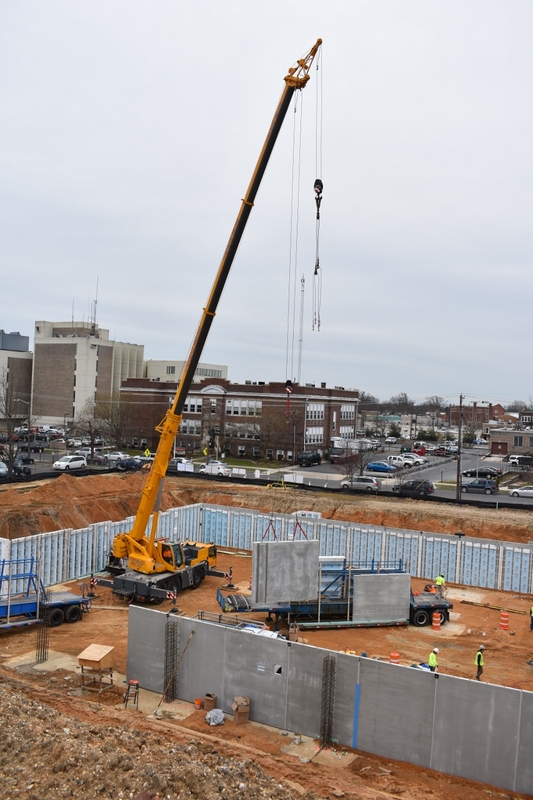 “The new two-story police department starts with energy-efficient Superior Walls® XiTM Wall panels. These are very ‘green’ products that were created locally in Millville, N.J. in a controlled environment. Myers and his team, located in New Brunswick, N.J., designed the 52,697-square-foot structure that will be located on the corner of East Plum and North 6th Streets, directly across from the existing police station. At the ground breaking in January of 2018, Vineland Mayor Anthony Fanucci praised the state-of-the-art facility planned for his city. The team at RPM Engineering LLC, out of Woodbury, N.J., served as the structural engineer on the project working with DI Group Architecture. Ambrus points out that the process of pouring vertical cast-in-place walls requires vibration of the concrete to remove air pockets. If the concrete is not properly vibrated, voids or honeycombing may occur in the concrete. That problem can cause weak spots in walls. Working with both the architectural and engineering teams on the project were the experts at Northeast Precast. “We worked directly with the project engineer at Northeast Precast,” says Ambrus. 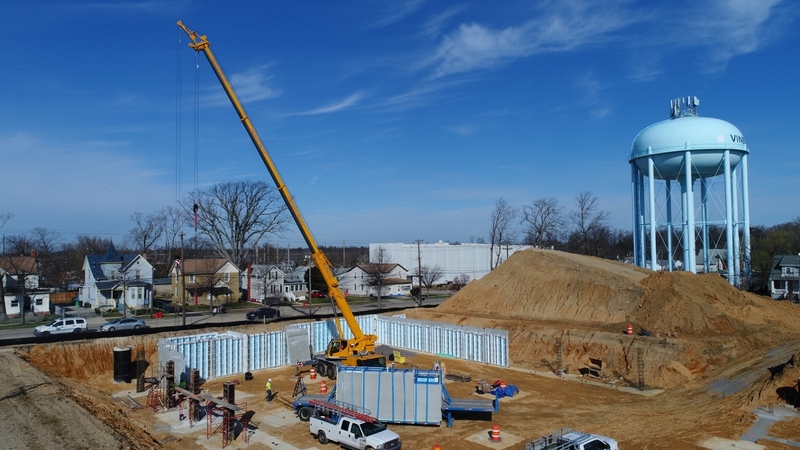 “This made it easy to understand the wall height limitations and interfacing requirements between the Superior Walls concrete foundation and the connections above. From Myers’ perspective, he was pleased to see the Superior Walls product selected for the foundation of the building. “The Vineland Police Station is a publicly-funded project,” says Myers. “Therefore we specified performance standards for precast wall and foundation systems that allowed competitive bidding. 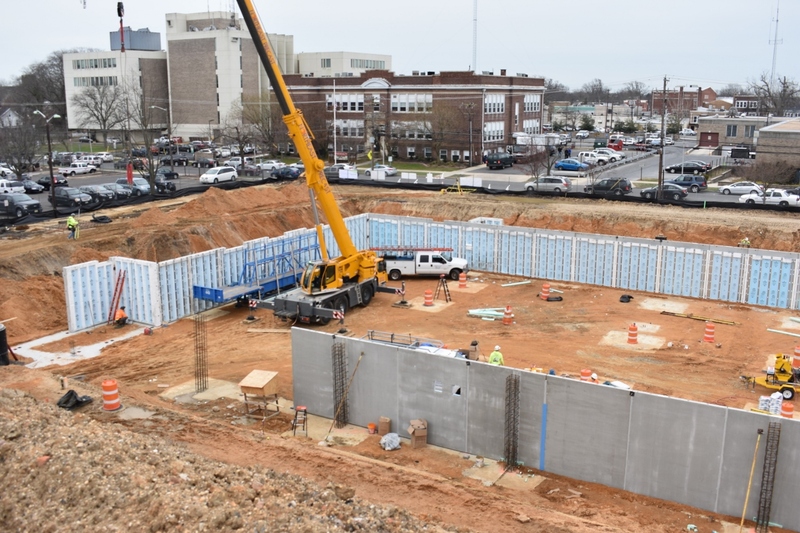 The benefits of Superior Walls foundation systems are substantial. The energy-efficient walls help lower energy costs and reduce energy leakage while providing increased space in a comfortable setting. 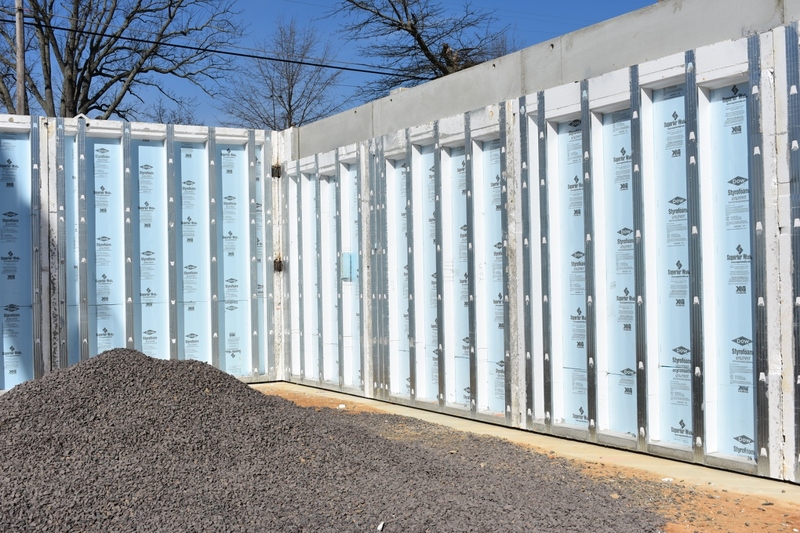 Since Superior Walls panels are designed and manufactured with insulated concrete studs, Superior Walls reduces the amount of materials used to build a structure, including wood and concrete. This helps reduce the carbon footprint of the new facility’s construction process.